British Trust for Ornithology, Thetford. Thetford Ringing Group and Nightjar Project. 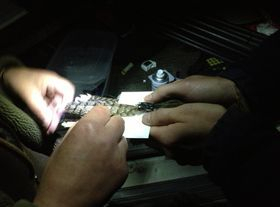 Above: A GPS data logger being fitted to the tail of a Eurasian Nightjar in Sherwood Forest, Nottinghamshire. The nightjars which breed in Sherwood Forest over-winter in sub-Saharan Africa but the precise location is unknown. This presents a fascinating opportunity for conservation and education projects to take place between schools in Nottinghamshire and sub-Saharan Africa. Including children in the Sherwood Nightjar Project is an incredibly important goal, and something which widens the scope of the project. Sherwood Forest is home to a nationally important breeding population of nightjars. These elusive nocturnal species has declined nationally and continues to do so in Sherwood forest. Our aim is to investigate how the forest can be effectively managed to maintain this species and many other species which reside within the forest. Our group comprises local experts on nightjars from Birklands Ringing Group, students and academics interested in bird behaviour, ecology and conservation from across the UK. In the past year we have successfully piloted the use of new miniature GPS loggers and we hope to continue this study in the coming years to build a detailed picture of nightjar behaviour both while breeding in Sherwood forest and also at their over-wintering destinations in sub-Saharan Africa. During the summer of 2013 we began an exciting new project to investigate habitat-use and behaviour in nightjars using state-of-the-art miniature GPS data loggers. This pilot project has been an enormous success and you will be able to read about it here soon! Being able to follow nightjars at night using high-precision devices such as these will, we hope, shed light on the difficult-to-study behaviour of this species. Left: One of our nightjar sites on a July evening. During the summer we are joined by various people who help with nightjar work. Every night for three months, people from the project are out in the forest recording activity and progress of nightjar pairs so that our GPS data can be related to pair success and habitat choice. Follow this link to find out details of this and other upcoming NWT events.